A Yearning Toward Wildness – Peachtree Publishing Company Inc. 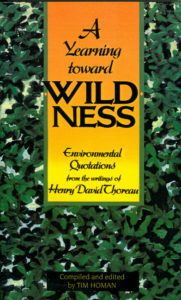 This volume features collected wisdom of Henry David Thoreau. Henry David Thoreau had a decidely modern mind, and many of his writings prove startlingly applicable to today’s world. An environmentalist, a nature lover, and a strong individualist, he spoke his mind without concern for controversy or common beliefs. Here, compiled by Tim Homan, is A Yearning Toward Wildness, the best of Henry David Thoreau on a variety of topics still important to us today, including conservation and preservation, hunting and trapping, and vegetarianism, as well as the bittersweet category of “wish it were still here.” Many of his quotations will stir familiar memories as well as strong feelings about the world we live in, a world Henry knew was coming. A Yearning Toward Wildness will provide inspiration and insight for our hectic lives.